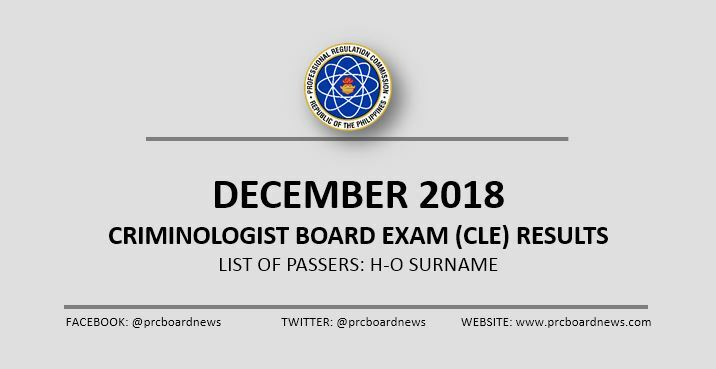 MANILA, Philippines – The December 2018 Criminologist board exam or Criminology Licensure Exam (CLE) results, together with the complete list of passers, top 10 (topnotchers) and performance of schools are released online on Saturday, January 12 or in 15 working days after the exam. As announced, 14,324 out of 41,341 (34.65%) passed the exams! The Professional Regulation Commission (PRC) and the Board of Criminology administered the CLE on December 14, 15 and 16 (Friday to Sunday) in Manila, All Regional Offices, Zamboanga, General Santos and Rosales, Pangasinan. Check out on this page for H-O list of passers. Registration for the issuance of Professional Identification Card (ID) and Certificate of Registration will be done on-line. Visit the official website of PRC (online.prc.gov.ph) and follow instructions for initial registration. According to PRC Resolution No. 2017-1068, the target release of results for December 2018 Criminology board exam is on January 10, 2019 (Thursday) or in 13 working days after the exam. However, results may be released ahead of the target or on later date without prior notice. We advise examinees to monitor announcement of results from January 4 (Friday) until the target date. Thanks a lot for sharing your post with us! It is a great pleasure to be updated with the latest news on this issue! bakit??? ?Updating for the official list of passers...refresh page for the results. kailan po ba irerelease yung result? wala pa rin po bang result ?